So, Many of you know that my husband is an avid hunter, and every year he looks forward to hunting season. Anyhow, this year he shot a really big deer! I was very proud of him, and he couldn't be happier. It's a once in a life time deer. :D So, here's a photo. It's span is 34 1/2 inches wide, and it has five points on each side... and it scores 200 (whatever that means) ;) Apparently he sent it to a taxidermist-- and he wants to hang its head on our wall. UGH! Scary-- i know! So my hubby is like jen come check out tysons deer on his e mail... hahaha.. I was a little confused but I guess your dad was all proud and forwarded tysons deer to us to show nate so we just got done talkin about it! I must say I think nate is a little jealous. :) were both impressed! I just hope you don't have to cut up all that meet and make your own jerky like I had to last year haha.. trust me it's not very fun and if you normally like eating it you might not enjoy it as much if you're the one who prepared it.. I dono maybe it's just me .. plus I was prego so maybe that had a lot to do with it! 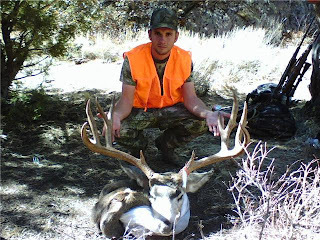 ha.. anyway congrats tyson on the HUGE deer that's awesome!